Smart Way Recycling provides full-service recycling, at our secured 95,000 sq ft commercial recycling facility in Oak Park, Michigan. Along with our onsite shredding service at your own office or facility, utilizing our Mobile Shredding trucks. The Cardboard Recycling Service at Smart Way Recycling was created to provide a sustainable and cost-effective alternative to putting cardboard into your standard solid waste container. Almost every business has a substantial amount of cardboard as a byproduct of their operations, and that cardboard takes up a lot of space when thrown into a dumpster. We service several newspapers companies, newspaper distributors, magazine publishers, magazine distributor. News papers and magazines are shredded and baled, and then shipped to their designated paper mills. Smart Way Recycling actively seeks to purchase pallets that need repairs. We specialize in buying and selling a variety of wood and GMA pallets, size 40x48. If you have damaged plastic pallets, plastic boxes, baskets, shells. We will pay you top dollar for your unused pallets. We are the leaders when it comes to scrap printers mix, mixed paper and white paper. We have state-of-the-art fluffing and bailing equipment to bale the scrap printer paper. 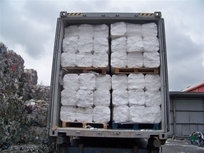 We are direct suppliers to paper mills that produce finished products by using recycled paper. Bulk loading & Trailer drop program. Gaylord Boxes & rolling bins program.